The OUTRAGEOUS life, Dwayne Morris. Copyright @ 2013 Dwayne Morris. 114 pages. Reviewed by Rev. Russell A. Whitfield. Dwayne Morris has written a compelling work that challenges one to reject simple ordinary living for God and dream big through the life of Gideon. As a former student minister and now a singles and discipleship minister, God has used Morris to speak into the lives of many students and adults to leverage their life for God’s glory. The book, the OUTRAGEOUS life, is a collection of chapters that covers an ordinary man’s journey to the OUTRAGEOUS life God had planned for him. The life of Gideon, from the book of Judges, portrays the fears, struggles, battles, and faith that come when one allows God to accomplish His purposes through him. 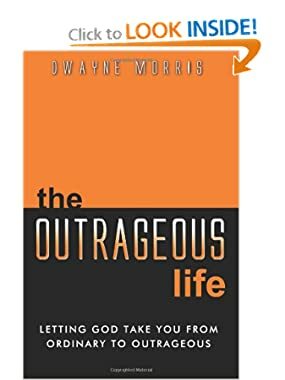 The Outrageous Life is comprised of eight chapters and a conclusion written to provide the reader with insights on how to let God take you from ordinary to outrageous. The book itself comes from the devotional thought of Morris as he studied Gideon’s own personal journey toward outrageous living. These eight chapters: Backstory, God is With You, My Contribution is Critical, My Obstacles are His Opportunities, Small Battles/Big Victories, Fear/Faith/and a Fleece, My Plan Limits His Possibilities, His Plan is to Reflect and Deflect break down the life of Gideon and other examples the author has included in his book aim to attribute praise to the King of Kings. As minister of singles and discipleship of First Baptist North Spartanburg in South Carolina, Morris has interwoven personal experiences of others with the story of Gideon out of the book of Judges to highlight what it truly means to live an outrageous life for God. It is the intent of the author to attribute all glory to God the Creator/Father and not himself or the individual Christian. The experiences of his own life and friends have been used as a wonderful way of illustrating what it truly means to allow God’s plans to exceed the individual’s plan. The Outrageous Life aligns life experiences of the author, other leaders, as well as the story of Gideon in order to portray a life that is more about what God can do with an ordinary life completely submissive to His plan. In the introduction, Morris reflects upon a challenging question that Alex Kendrick of Sherwood films was asked by God. This challenging question is one every Christian must deal with as they decide to follow God. The question, would you rather have an easier road with less fruit or a harder road with more fruit, provides an important entry level into the discussion of how Gideon allowed God to take him from ordinary to outrageous. Morris continues as he remembers his childhood Sunday school attendance star chart. This traditional chart merely represents the things needed in order to get the star for the week, and according the author is a shallow way to evaluate one’s spiritual growth. It is the point of this book to show the reader key principles to urge them to pursue outrageous living rather than satisfying for the ordinary getting a Sunday school star. The first chapter, Backstory, invites the reader to rewind a few pages and take a look at the introduction if they have not already. He then moves to share background information that begins back in the Garden of Eden, to Abraham (first family), Joseph, Moses, Joshua, which led eventually to the story of Gideon an ordinary man. The second chapter, God is With You, is where Morris introduces this man named Gideon to his readers. The chapter opens with a powerful story that emphasizes the unlimited potential one has when they know they have great power, from God, much like the place Gideon found himself. As Morris concludes this chapter, “…the outrageous life begins with knowing the Lord and realizing that God is with you and you are not alone”. The third chapter titled My Contribution is Critical, transits from assurance that God is with His people to consideration as to contribution one can offer to God’s plan. An important question coined by Morris concerning contribution aims to lead his readers from focusing on what they can’t offer, to what they can offer to God? He uses a personal story from one who has not backed down from what they believed God had wanted them to do. As Morris shares this inspiring story about one who began a ministry for orphaned children in Nicaragua, one can’t help but recognize the process of how God has used an ordinary person to do an Outrageous feat for God. As the author ends this chapter, he moves to an analogy of running as a means to portray the attitude of moving past the individual’s limits. The fourth chapter, My Obstacles are His Opportunities, Morris introduces through the eyes of a child when it comes to understanding or viewing one’s obstacles or problems. As the author puts it, “the perspective will either compel one or skew one’s perspective on their problems.” He continues talking about how Gideon seems to be a master of excuses, and urges his readers to consider if they are an excuse-maker. Morris explains to his readers the key challenge for everyone is to understand how they will view their obstacles. As this chapter comes to an end, Morris discusses with his readers the proper response needed as one faces obstacles of life. He covers three subheadings: making excuses, striving to fix it without help, or let God handle it. The fifth chapter titled Small Battles, Big Victories starts out with two tests God had planned in order to test Gideon’s obedience. As Gideon passed these two tests highlighted at the beginning of the chapter, one may expect to see God take him further in his obedience. Morris summarize these ideas by telling his readers the importance of being found “…obedient in the small things will lead God to trust them with larger opportunities.” For Gideon, as well as other believers, the victory was often found in his obedience not in the action. The sixth chapter titled, Fear/Faith/a Fleece, begins with a personal illustration of a summer day as a college student to introduce the battle between courage and fear that Gideon himself may have struggled with as he dealt with God’s call. He uses the story from Judges 6:38-40 where Gideon was dialoguing with God about a wool fleece as a challenge to God, to highlight the how easy it could have been for Gideon to let fear keep him from experiencing God’s best. Through several examples in this chapter, Morris also argues that a certain degree of fear is healthy as long as it does not paralyze us. At the end of chapter six, the author shares a result of a research done on a group of people of the age of 95 or older when asked, “If you could live life over, what would you do differently.” The result of this research seemed an obvious, “I would take more risks.” The seventh chapter, My Plan Limits His Possibilities, begins with a quote from Ephesians 3:20 to encourage his readers that God’s plan is greater than anything we could ever imagine. The author writes about the time God narrowed Gideon’s army exceedingly lower than Gideon himself would have done. The story of Caz McCaslin and the beginning steps of what is now considered one the largest sports outreach ministries called “Upward Sports” gives the readers a modern day Gideon story. At the end of this chapter, Morris communicates the importance of a whole-hearted devotion to God’s plan rather than the individual’s. The last chapter, His Plan is to Reflect and Deflect, communicates the need to attribute praise to God for work accomplish through Gideon’s experiences or the individual believer’s experiences. This chapter recognizes the difficulty of “Reflecting and Deflecting” in the current culture. An individual, like Gideon, must learn to model “Reflection” of God’s character and “Deflect” the praise to the One it is due–God! At the end of the day, “outrageous living is more concerned with God getting the glory rather than the individual.” Morris offered a concluding section of his book that served to sum up the main highlights of Gideon’s story and the Outrageous task at hand. The review found in this short conclusion highlights these areas: God is with us, Our ontribution is critical, Our obstacles will be His opportunities, There will be small battles and great victories, Our plans can get in the way, and The bottom line is to glorify God, not ourselves. The process of writing this book, according to Morris, was to allow God to direct his steps much like Gideon allowed God to direct his. The Outrageous Life, in my opinion, is a motivational book written in the most practical way for every believer young or old to understand how they can experience the Outrageous life God has in store for them through the experiences of Gideon. Morris has put together an inspiring work that comes straight from the overflow of his heart, and intends to cut to its reader’s heart as they consider the life they too can lead. The personal experiences interwoven throughout this book has proven relevance of an older text in the life of today’s believer. I intend to purchase my own copy and others for later use both personally as well as corporately.